Two of baking challenges that I like to take part in have the theme of 'America' this month. We Should Cocoa, which is guest hosted by It's Not Easy Being Greedy, wants participants to make something with an American theme, containing chocolate and the Formula 1 Foods challenge at Caroline Makes has reached the American leg of the F1GP circuit, so is inviting entries of any American inspired cooking. On the face of it, American inspired baking, containing chocolate, is easy - I imagine almost everyone would suggest brownies at this point, but Devil's Food Cake and Mississippi Mud Pie spring to mind too. Once I'd decided to go with brownies (as they fitted in with my baking plans), I wanted produce a brownie with flavours that couldn't have come from anywhere else but America, which is why I ended up with the idea of adding peanut butter and jelly (jam) - a delicious combination which is rarely seen in Britain. I looked at a few recipes online, and found various suggestions, such as making a batter with added peanut butter, or mixing it with cream cheese. I couldn't decide on the best approach until I found a blog post which said - take your favourite brownie recipe, and ripple in half a cup of peanut butter and half a cup of jam. Simple! So that's what I did. My favourite brownie recipe involves melting 140g each of butter and dark chocolate, stirring in 300g of light muscovado sugar, three eggs and a dash of vanilla extract, then folding in 160g plain flour and 3 tablespoons cocoa. Once the batter was made, I put roughly 3/4 of it into a 20cm(8") square baking tin (lined with baking parchment). Then I dotted teaspoonsful of smooth peanut butter and 'cherries and berries' jam onto the batter, using about 125g of each. The remaining brownie batter was drizzled over the surface, covering some of the peanut butter and jam, but not all of it. Lastly, I used the handle of a teaspoon to mix the peanut butter, jam and top layer of batter together in random swirls, and scattered over 30g of chopped roasted salted peanuts. The brownie tray was cooked at 180C until firm but not too dry. The end point was difficult to determine as a probe hitting peanut butter or jam made the mixture seem underdone. I think, having given it 40 minutes, that I over-baked this batch slightly. Next time I'll try a few minutes less. Over-baking aside, these brownies were really good. Using the peanut butter undiluted by cake batter or cream cheese meant that the flavour was still strong, and the cherries and berries jam added little bursts of tart fruitiness. The crunchy topping of salted peanuts added another layer to the complexities of flavour and texture. I was particularly keen to try peanut butter and chocolate together, as I recently tried a pack of peanut butter flavoured Oreo biscuits. I've seen these cropping up in a lot of blog posts recently, so was intrigued enough to try them when I saw them in stock in my local supermarket. What a disappointment! I couldn't taste the peanut butter at all, so it was no surprise to read the ingredient list and find there were no real peanuts in the biscuit filling - only 'flavouring'! It's also been National Chocolate Week this week, so my post is just in time to celebrate that, although chocolate is part of my everyday life - I don't need a special week to celebrate it! We Should Cocoa (rules here) is the brainchild of Choclette, who writes the Tin and Thyme blog, although she often has guest hosts to share the duties of taking in the entries and compiling the end of month round up. Caroline, at Caroline Makes, started the Formula 1 Food challenge at the start of this season, because her boyfriend is an avid motor racing fan. It hasn't gained a huge following, but I've had a lot of fun trying to find foods from the various countries where the races have taken place. It's sometimes been difficult to find something which I feel competent enough to tackle. The last three races of the season are in Mexico, Brazil and Abu Dhabi, the last of which sounds particularly challenging. oh wow... PBJ brownies. What a brilliant idea. I am completely in love with these! Thanks so much for sharing these little beauties for #WeShouldCocoa - these definitely fit the USA+chocolate brief. I love the idea of swirling the PB into the mixture. Also glad to hear your thoughts on the Oreos, I was also tempted to try them but I don't think I'll bother. Wow, these sound good. Lovely combination of ingredients, and very American. Wow these look great, I love chocolate and peanut butter together and would never have thought to add jam! 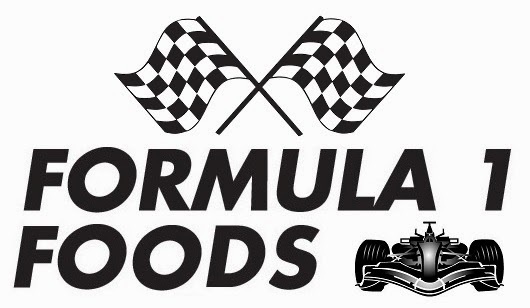 Thanks for entering Formula 1 Foods. Peanut butter biscuits with NO peanut butter in them, what a con! Your brownies definitely get top marks for US authenticity. I can't help but think of Elvis whenever I hear of this combination. And despite having heard of the combination for more years than I care to remember, I have never tried it. I do like this idea though and have bookmarked.